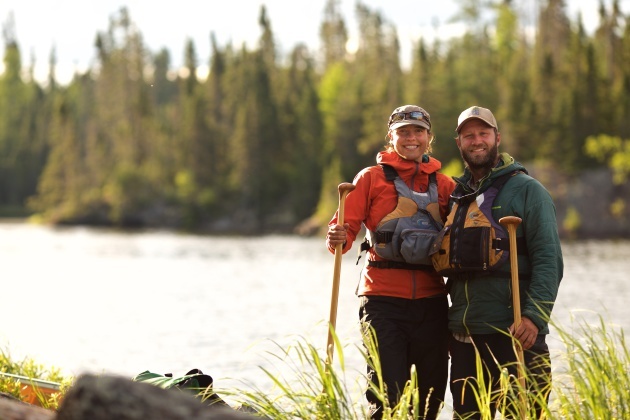 Milkweed Editions publisher Daniel Slager "paddled into the wilderness" last month to broker a book deal with Dave and Amy Freeman, the couple who spent an entire year living in the Boundary Waters Canoe Area Wilderness. The Freemans departed Sept. 23, 2015, for a year meant to raise awareness of the environment and the proposed Twin Metals Minnesota sulfide-ore copper mining operation just on the edge of the BWCA. They camped at 120 sites, explored 500 lakes, rivers and streams, and traveled more than 2,000 miles by canoe, foot, ski, snowshoe and dog team, accoding to the press release released by Milkweed. The couple returned last week. "Our exit from the Wilderness today is bittersweet," Amy Freeman said in the press release. "We love this place and honestly wouldn't mind staying a bit longer, but we are eager to catch up with family and friends." They documented their experience through social media, National Geographic and Canoe & Kayak magazine, and they have neen featured on TV's "The Today Show." The Star Tribune wrote about them last week and last December. They will spend the next several months working on a book, which will be published iin Fall 2017 by Milkweed. Milkweed Editions of Minneapolis publishes fiction, nonfiction and poetry, and many of their books have a concentration on the wilderness and the environment.